Anyone that has had breakfast with me knows that I’m a pancake aficionado. I’m very particular about my pancakes (they must have the right flavor, texture, crust, and toppings), and if I find a proper pancake I’ll go way out of my way for them. Which brings us to Polly’s Pancake Parlor, where we went on Saturday. We make it a point to go at least once a year, usually combining it with hiking in the White Mountains. Located in Sugar Hill, New Hampshire (about 20 minutes from Franconia Notch), Polly’s is a modestly-sized pancake dining room attached to an old sugarhouse (in which they make their own maple products). Sure, New Hampshire and Vermont, especially during mapling season, are chock full of sugarhouses and pancake joints. But, in my not-so-humble opinion, Polly’s is the queen of New England pancake joints, and forever tied for first place on my list with Al’s Breakfast of Minneapolis for Best Pancake Ever and Best Breakfast Ever. Why? Simply because Polly’s does everything right for a breakfast. Perfect pancakes, excellent sides, good coffee, friendly service…. 1. Pancakes. They do everything right, from allowing you to mix and match your batter (usually buttermilk, oatmeal, buckwheat, and whole wheat are available) and add-ins (usually blueberrys, walnuts, and chocolate chips), and they serve the pancakes to you in shifts of three so they are always fresh. 2. Maple products. The maple syrup at Polly’s is very good, and free-flowing. No little tiny cups of syrup here. Same with the maple spread and maple sugar (mmm, maple sugar in my coffee). 4. The environment: Polly’s has an excellent view of the White Mountains, and the restaurant itself is very friendly (if packed). The service is friendly, and, as an odd note, the servers are also the people that cook the pancakes. 1. I’m obviously not the only fanatic of this place. It’s usually very, very busy (it wasn’t this Saturday, however), and sometimes I’ve had to wait an hour to get seated. 2. It’s not the cheapest breakfast out there, all that maple syrup and top-notch bacon comes with a price tag. Carol and I average around $12/person when we go here, although we leave very full (they have an all-you-can eat option, but I’ve never been able to starve myself to the point that would be cost-effective). Still, at $12/meal, it’s at least twice as good as most $6 breakfasts out there. 3. The drive. By the fastest possible route, it’s at least an hour away from the Upper Valley. So you really do need to get up early and make a day of it by partaking of some of the other White Mountain attractions. As I said, this place is good enough that I head up there at least once a season, if not twice. So I heartily recommend it. Best. Breakfast. Ever. On the busy part of things, it seems to be a remarkably well-kept secret that you can call in advance to be put on a waiting list. So figure out when you’re about an hour away from arriving there, then call and say you’re about an hour away and that you’d like to be put on the waiting list. It reduces the wait time significantly! We drove all the way from Canada for the pancakes. Well, okay we were camping in New Hampshire but we had been waiting for those pancakes for 15 years. 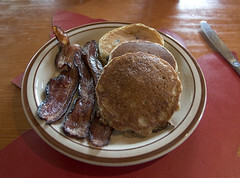 You can read about our visit at http://www.squidoo.com/pollys-pancake-parlor . I would be thrilled if you would visit and leave your thoughts! wanted to find out if this friday would be a good day for the leaves up that way. We are planning on coming up to eat and take in the leaves. It should be a good day for it if it’s not raining. Leaves are doing decently down here, and should be at peak around now in Sugar Hill. Sometimes I really worry about the state of donuts these days. Most of the local donut places have closed and been replaced by Tim Hortons or Dunkin Donuts. And worse yet, most of those don’t even cook the donuts on site anymore, they truck them in (it’s no longer “time to make the donuts”). So most donuts these days are stale, pale imitations of what a donut should be. But every once in a while I find a local donut place that shows that some people still care and try and make a good product. One of these is Allie’s Donuts in North Kingstown, RI. I went there several times a kid with my grandpa, but in recent years I’ve either never been around at breakfast time, or it’s been a holiday and Allie’s was closed.